Set in the political snake-pit of Elizabethan England, Columbia Pictures' new thriller “Anonymous” speculates on an issue that has for centuries intrigued academics and brilliant minds such as Mark Twain, Charles Dickens, and Sigmund Freud, namely: who actually created the body of work credited to William Shakespeare? Experts have debated, books have been written, and scholars have devoted their lives to protecting or debunking theories surrounding the authorship of the most renowned works in English literature. “Anonymous” poses one possible answer, focusing on a time when scandalous political intrigue, illicit romances in the Royal Court, and the schemes of greedy nobles lusting for the power of the throne were brought to light in the most unlikely of places: the London stage. To be shown soon exclusively at Ayala Malls Cinemas (Glorietta 4, Greenbelt 3 and Trinoma), “Anonymous” stars Rhys Ifans, Vanessa Redgrave, Joely Richardson, David Thewlis, Xavier Samuel, Sebastian Armesto, Rafe Spall, Edward Hogg, Jamie Campbell Bower, and Derek Jacobi. The film is directed by Roland Emmerich from the script by John Orloff. Emmerich was immediately receptive to Orloff’s idea – and the director had some big ideas that he felt the story could support. 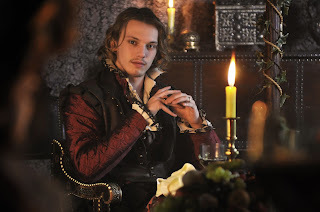 “The script is very much about the relationship between Ben Jonson, William Shakespeare, and Edward De Vere – that is very much the heart of the movie – but I felt it just needed a little more than that. I asked myself, ‘What was the most important thing in that era?’ and it was clearly succession” – the question of who would follow the heirless Elizabeth on the throne. That said, Winkler goes on that she expects Emmerich’s film to be controversial. “There is quite a radical group of Stratfordians out there who feel very strongly about preserving the image of Shakespeare as the writer of the plays and sonnets,” she says.